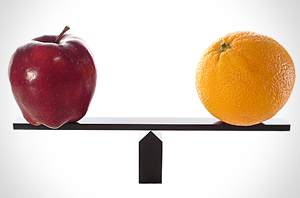 In previous posts, we’ve discussed different aspects of A/B testing before, including the fact that an Internet marketer needs to attempt to find the ideal middle ground between high conversion rates and effective CTR. Because these two metrics have an inverse relationship, it can be tricky to get the process just right. At Webati, we’d like to share a few thoughts we have when it comes to testing multiple landing pages and ad copy for your PPC campaign. After enough time has passed for you to accrue a mature keyword list, it will not be difficult to identify the KWs that have a quality score lower than 7/10. We believe that this score is more than adequate for keywords that are not branded. When we refer to top cost keywords, we are referring to generic keywords. With generic keywords, any improvement in quality score is going to make a significant difference. Before you begin A/B testing, isolate your top cost keywords into specific ad groups, so that ads and landing pages can be fine-tuned specifically for them. A/B testing is also going to provide the ideal time to separate your best performing campaigns by device or geo specific data. Examining each element will assist you in brainstorming the best creative for each keyword and for each location and device. This effort is going to take a considerable amount of time, but it will be effective when you want to tier your campaigns. At Webati, we like numbers. While there is not a perfect formula for determining the best ad copy, you should be aware that a significant portion of your success is going to be dependent upon your abilities to derive conclusions from looking at numeric data. Additionally, you are also going to need to be aware of your competition. Every 2-4 weeks, perform a search for your top keywords in both Bing and Google. Doing so is going to enable you to see what your competition is involved in in regards to both SEO and SEM. The unique positioning you are in should be taken advantage of. Identify your available opportunities in terms of free shipping, quality, price, etc. If you want to see unbiased data, then AdWords AdPreview Tool is an excellent one to use. While going through the motions of testing a variety of landing pages and ads, it is going to be important for you to pay attention to the “Segment: Top vs. Other” distribution found in AdWords. This simple metric is going to tell you whether or not your particular ads are present in the top search results. It can take some amount of trial and error before you can find the ideal balance between strong enough conversion rates and adequate CTR. In the end, successful A/B testing is going to be owed to a blend of the appealing ad copies, which are needed to achieve the high quality scores one is looking for, and a strong conversion rate. If you need assistance with determining what your CTR should be or any other aspect of maximizing your conversion rates, give Webati a call today.